CHINA - China's consumer price index, a main gauge of inflation, rose 1.2 per cent year on year in April, official data showed on Wednesday. The growth quickened from March's 0.9 per cent expansion and February's 0.8 per cent. 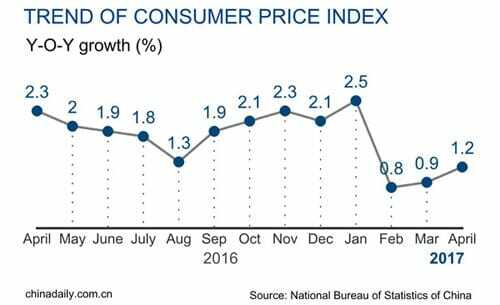 On a monthly basis, the CPI climbed 0.1 per cent, according to the National Bureau of Statistics (NBS). NBS attributed the pick-up in CPI to higher non-food prices, which grew 2.4 per cent year on year in April. Food prices, however, declined 3.5 per cent as vegetable prices fell 21.6 per cent from a year earlier on ample supplies. The costs of pork and eggs dropped 8.1 per cent and 11.4 per cent, respectively. 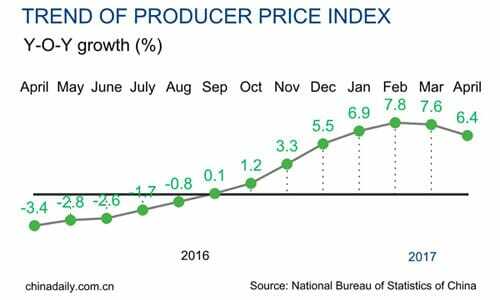 China's producer price index (PPI), which measures costs for goods at the factory gate, rose 6.4 per cent year on year in April. The pace further eased from the 7.6 per cent registered in March, according to the National Bureau of Statistics. Month on Month, the PPI edged down 0.4 per cent, the first monthly drop since July last year. Price declines widened in major industries in April, with factory-gate prices in the oil and gas extraction industry down 4.2 per cent from a month earlier, noted NBS senior statistician Sheng Guoqing. China's PPI has stayed in positive territory since September, when it ended a four-year streak of declines, partly due to the government's successful campaign to cut industrial overcapacity, which benefited the wider economy. While the inflation is cooling in recent months, a slide back into deflation is not expected as robust demand, efforts to close excess capacity, and a weaker yuan are all preventing a sharper slide in the index, noted Tom Orlik, chief Asia economist at Bloomberg. But the deceleration in prices will reduce benefits to the broader economy such as increasing corporate profits, he added. The PPI figures came alongside the release of the consumer price index, which rose 1.2 per cent in April.